I serve as the strategic communications manager for The Navigators. I keep my ministry supporters up to date through regular updates. Below is an archive of those posts. For a general overview of my work with The Navigators click here. In this video update I talk about the research we performed during the project to refresh The Navigators brand. I show a “word cloud” of the most words and phrases people used while being interviewed, then share the four core brand attributes our team decided upon. This is the second of four video updates I produced covering The Navigators brand refresh. Click the links before to view the other updates. In this video update I give an overview of a project I’ve been on for roughly a year now: the refresh and clarification of The Navigators brand. I go into what makes up a brand in general, why The Navigators felt it needed to address the state of its brand, and what roles I’ve played throughout this project. This is the first of four video updates I produced covering The Navigators brand refresh. Click the links before to view the other updates. As I look ahead I am so excited to begin my second year in this role. God is doing some amazing things in The Navigators and I can’t wait to share them with you! Harvest Episode 04 is Now Streaming! I am absolutely thrilled to announce that Harvest episode 04 is now available for streaming. This episode covers the discipleship process and maps out three crucial insights that will help you as you disciple others. You can watch it below. This episode of Harvest was completed several weeks ago, but I chose to delay the release until today. I wanted it to be one of the first new blog posts on the new Navigators.org website. The site went live later than we had originally anticipated it would, which in turn pushed the video’s release date back. Prior to the release of this episode I made the decision to shut down the dedicated website and social media presence for Harvest. The website address harvestseries.tv now takes you to a page dedicated to Harvest on The Navigators website. From the inception of the series I’ve wanted these films to be first and foremost about advancing a movement, not an organization. I still feel it’s important for the videos themselves to be free of Navigator branding and references in order to keep it clear to the viewer that discipleship is a biblical imperative and not an organizational invention. However, I’ve come to believe that not having the videos housed within the organization’s main web presence is overkill. Increasing the visibility of the project is far more important. These Harvest episodes have typically been released about a year apart from each other. Sometimes that’s due to funding, sometimes it’s due to other outside factors. But episode 05 has already been paid for and the teaching segments have all been filmed. What remains is filming the b-roll footage and the post-production work. I’m projecting that the next episode will be released early next year. Each Harvest video has been made possible by your financial support. I couldn’t have done any of this without you. Thank you for your continued support of my ministry with The Navigators! Earlier this week I wrote about the launch of the new Navigators.org website. It was a project months in the making. Everyone involved is extremely proud of the final product. For those of you who are interested in how websites are made I thought I’d share with you some of what’s being used behind the scenes. While I usually find myself in the position of designing and developing Navigator website when they’re needed, on a project of this profile and scope the organization hired a large firm called Masterworks to handle it all. And I’m glad they did—the level of technical expertise needed to achieve the different database integrations is well above my skill level. I am absolutely thrilled that we used self-hosted WordPress as the CMS for the new website. The site is being hosted on WP Engine servers, one of the better hosting options out there for WordPress websites. The site uses a custom theme built on the _s starter theme. This goes against my personal preference of using a parent/child theme setup. Throughout this project I did my best not to tell the developers how to build the website, rather I shared only what we needed the website to do. It wasn’t always easy for me to bite my tongue, especially on this point, but I trust their team to make good decisions for us. Numerous plugins are used on the new website. Here are some of the key plugins we’re using. Yoast SEO Premium — I’ve actually never used the premium version of Yoast SEO before, but with all the URL redirects we will need it only made sense to upgrade to this version. Meta Box — When I build websites and need to add meta boxes and custom fields to the post editor I code them by hand. It’s a bit of a pain; Masterworks thinks so too. So instead they make use of this Meta Box plugin. It’s a simple drag-and-drop solution for meta boxes and custom fields, something the site makes extensive use of. PublishPress — I’m acting as the managing editor for the blog. In that capacity I’ll be overseeing a lot of authors, some in the communications department and others who serve as field staff around the country. I need a solid editorial workflow solution to manage it all, and PublishPress is one of the best such tools out there. Gravity Forms — All the contact forms on the website make use of Gravity Forms, which for my money is the very best form creator for WordPress. I use it on nearly every website I build. WP Store Locator — The Navigators serve in a lot of locations. That data is all stored in our HR system, but we needed a way to present that information visually on the website once it was imported. We’re using a plugin ostensibly designed for showing franchise locations to achieve that end. WP 101 — Since not all of my contributing authors have used WordPress before, and because I didn’t want for our team to have to answer lots of basic WordPress questions from these authors, I added this plugin to help guide these new users. On the previous version of our website it was very difficult to add new features when we needed them. That’s not the case now. When we see a need for something new we’ll be in a position to add it much more easily. In fact, I already have a desire to add a timeline showing the history of The Navigators. I hope you enjoyed this peek behind the scenes of our new website. If you have questions or thoughts to share leave me a comment below. The New Navigators.org Website is Live! Ever since joining the communications department back in November I have been part of a team of people helping to create the new Navigators.org website. I’m happy to announce that this new website is now live! Click here to see it! There are a few features and improvements over the previous design that I’m particularly excited about. 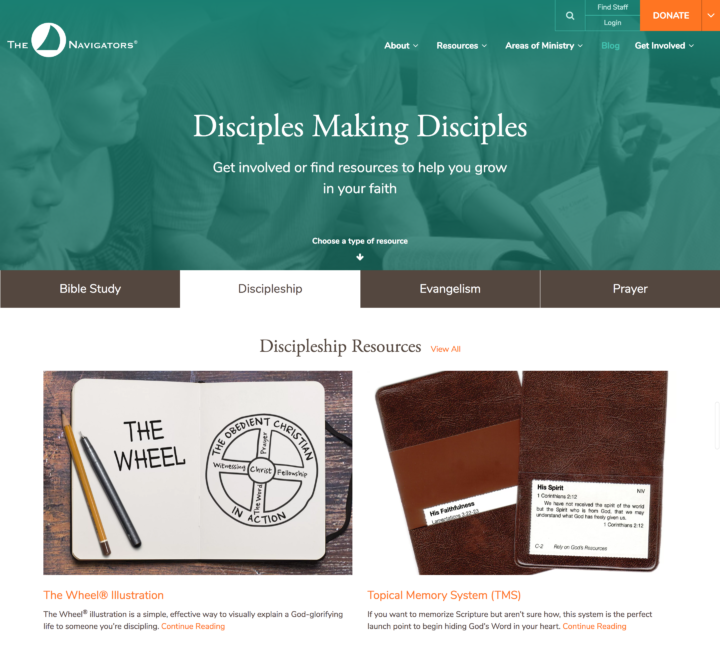 When you first arrive on the homepage, links to our best discipleship resources are the first things you see. The website looks and works beautifully on mobile devices. For the first time ever Navigators.org has a blog! Regarding the blog, I will be serving as its managing editor. We will be publishing two kinds of blog posts: stories of what is happening in our ministry and tools that resource those who are making disciples. Copyright © 2019 Andrew Ledwith. Website developed and maintained by Ledwith Web Solutions.